By 1940 Japan's war of expansion in China had bogged down into a stalemate. The Chinese were unable to make military gains against the Japanese, but their resistance had stopped the Japanese. In response, the frustrated Japanese tried harder. They started the "Three Alls Policy" – kill all, loot all, burn all (三光政策). Rather than admit failure and withdraw to Manchuria, they chose more offense – as happened at times in Europe during World War I. The Japanese were proud. Japanese warriors don't withdraw for the sake of peace. Patriotic emotions intensified. In March 1940, Japan's parliament, the Diet, unanimously passed a declaration of support for holy war against China, and in the spring of 1940 the Japanese launched a new offensive. Admiral Yamamoto. Click for details. Japanese controlled areas during the stalemate of 1940, in yellow. Click for minor enlargement. In the summer of 1940, Germany's military rolled over the French and Dutch in Europe, and Japanese strategists were concerned that the victorious Germans might wish to re-establish a presence in the South Pacific. Germany's successes encouraged Japan to expand into the Southeast Asia and the South Pacific region. Japan needed steel for its war machine. For the sake of "imperial self-sufficiency" Japan was interested in acquiring secure oil supplies and other materials from European-ruled Southeast Asia – the Dutch in the Indonesian Archipelago, the British in Malay and northern Borneo, and the French in Indochina. With Germany threatening Britain, Japan's strategists saw Britain as too occupied to defend its interests in East Asia. There was the problem of the Americans. But, on July 2, Japan's leaders met at one of their Imperial conferences and decided not to be deterred by the possibility of war with the United States in fulfilling their ambitions. They affirmed their commitment to victory in China and to building a "Co-Prosperity Sphere" in East Asia. The Japanese bargained with the weakened French and won permission from them to move into northern Vietnam, which they did on September 22. From here they began bombing southwest China, adding to their blockade against Chiang Kai-shek's forces. Hirohito was bothered by what he saw as his nation acting dishonorably, "like a thief after a fire," taking advantage of France after its defeat. But he went along with it, not wishing to be out-of-step with what was seen as necessary for Japan's war effort. The United States responded to Japan's move into Vietnam and Indochina by abrogating America's commercial treaty with Japan. President Franklin Roosevelt's administration embargoed scrap iron and steel that US companies had been selling to Japan -- nearly seventy percent of Japan's supply of these materials. Roosevelt encouraged the Dutch in Indonesia to stop selling oil to Japan. To avoid pushing the Japanese into war with the US, it continued to allow Americans to sell oil to Japan. It kept oil as a bargaining lever against the Japanese. Japan had been reluctant to tie itself to European conflicts but now saw advantage in it. The Japanese responded to Germany's call for a pact. And on September 27, Japan signed a treaty with Germany and Italy – the Tripartite Pact. Japan, Germany and Italy promised to join either of the other two should one of them go to war against any power not presently at war – a pact aimed against the United States. Joining the pact in late November was Hungary, Romania and Slovakia. Bulgaria was to join on March 1, 1941. Following the signing of the Tripartite Pact the US State Department ordered all Americans to return home from the Far East – except for military personnel, who were mainly in the Philippines. The British announced that they would open a road through Burma, north to Chongqing, to overcome Japan's blockade of China, and Tokyo threatened to declare war on Britain. Hoping to cripple Britain, Germany was trying to encourage Japan to move against the British at Singapore – the island and naval base at the southern tip of the Malay Peninsula. Germany's foreign minister, Ribbentrop, advised Japan's military attaché in Berlin that while moving south "the best way to keep America out of the war" would be not declaring war. 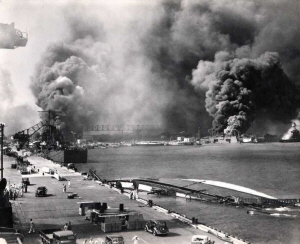 The Japanese told the Germans that preparations for taking Singapore would be completed by the end of May, 1941, and that war with the United States could not be ruled out. Meanwhile, Admiral Yamamoto was concerned that when Japan moved against Singapore and into the Indonesian Archipelago the US could send its forces out from Pearl Harbor and hit Japan's forces on their flank. 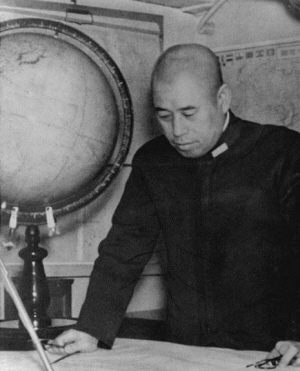 In early 1941 Yamamoto announced to his colleagues that simultaneous with Japan's invasion of Southeast Asia and the unhappy event of a war with the United States, Japan should cripple America's Pacific fleet by an air offensive. This he believed would damage American civil and military morale, perhaps to the point of rendering the Americans helpless and would prevent the US from launching "disturbing air strikes" against Japanese cities. Such a mission against the Americans, Yamamoto admitted, would be risky and, with much at stake, divine assistance would be needed. 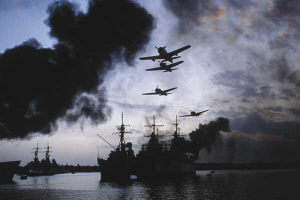 Japanese strategists saw the US Pacific Fleet at Pearl Harbor as a threat to their shipping lanes, and they saw a need to eliminate US bases in the Philippines and Guam – which would be a threat to Japan transporting oil from Indonesia. Invading Hawaii with troops was rejected, although it would have given the Japanese greater control over the Pacific. Japanese intelligence was over-estimating the size of the American forces in the Hawaiian Islands. The Japanese believed they could not spare troops from their planned movement of troops in the direction of the Malay Peninsula, Dutch Indonesia and the Philippines, and they figured that adding troop transports to the strike force against Hawaii would slow it to eight knots and increase the chance of it being detected by the United States.